UK regulators generally impose price controls via an 'Inflation-X' formula:- prices are allowed to rise in line with an inflation index less an X% reduction each year to pass on to customers the benefit of improved efficiency. The most common formula has been RPI-X but CPIH is gaining ground in place of RPI. This formula works well in a wide variety of circumstances, mainly because there are three main players in the regulatory contest: the company, its investors and the regulator. Regulated companies, implicitly - and sometimes explicitly - supported by their owners/investors, will often kick up quite a fuss in the final stages of a price control discussion, claiming that there is no way that the company can meet the regulators' '-X' efficiency target, and trying to browbeat or scare the regulator into making further concessions. But the owners/investors change sides when the new price control kicks in, and will generally put a lot of pressure on the company's managers to cut costs to as to beat the price control and make extra profits - and it is amazing how often the supposedly impossible efficiency targets have in practice been exceeded. Note, though, that this merry dance hides a great danger. John Kay points out that many - and sometimes most - people who work in utility companies are employed to stop things going wrong or to fix them when they goo wrong. If all those employees were sacked then water and electricity would continue flowing whilst costs fell and share prices rose, along with executive remuneration. And the MacWhirr Syndrome would ensure that no attempt would be made to change course - until customers were poisoned or there was an extended failure of supply. Price control efficiency targets are often met through capital investment but it is sometimes argued that the formula may reduce the incentive to innovate and invest in the short term, even though such investment might benefit both consumers and the company in the longer term. But the CAA has managed to overcome this problem by incentivising terminal and runway investment via its price controls. Ofgem, however, faces tricky decisions about whether it should incentivise investment in renewable energy. Why should the regulator in effect tax all gas and electricity customers in order to meet 'green' targets? Shouldn't such taxation be imposed transparently by Parliament? Financing costs are assessed by applying an appropriate rate of return (the Cost of Capital - see further below) to the Regulatory Asset Base (the RAB). There is often much nerdy argument about what assets should and should not be in the RAB, and the appropriate cost of capital. Interestingly, though, the RAB can include wasted capital expenditure, such as the large amounts of money that owners of Stansted Airport spent on seeking permission to build a new runway. Even though those plans were abandoned, the costs were still remunerated within the RAB. The result is an permitted average annual price rise of RPI-X which often has to be apportioned amongst various products, so that some prices may rise a little faster than RPI-X as long as others rise less fast than RPI-X. The January 2014 rail price control was interesting in that the government had announced that the average price rise would be 4.1%, and the maximum would be 9.1%, Facing voter concern about the cost of living, the government subsequently revised the second figure to 6.1%, without reducing the average increase, thus helping those passengers who would have faced steep increases, but disadvantaging those who would have benefitted from the fare reductions that would have been needed to balance the increases above 6.1%. Price controls in capital intensive industries - and most utilities are highly capital intensive - are greatly influenced by the forecast cost of financing their operations. Regulators approach this by estimating the cost of risk-free borrowing, which ought to be around the cost of government borrowing - that is the yield on gilt-edged securities. They then add a premium to reflect the cost attributable to the additional risk of investing in that industry. Embarrassingly, though regulators seem to have been caught out by the falling cost of risk-free borrowing since the early 2000s. 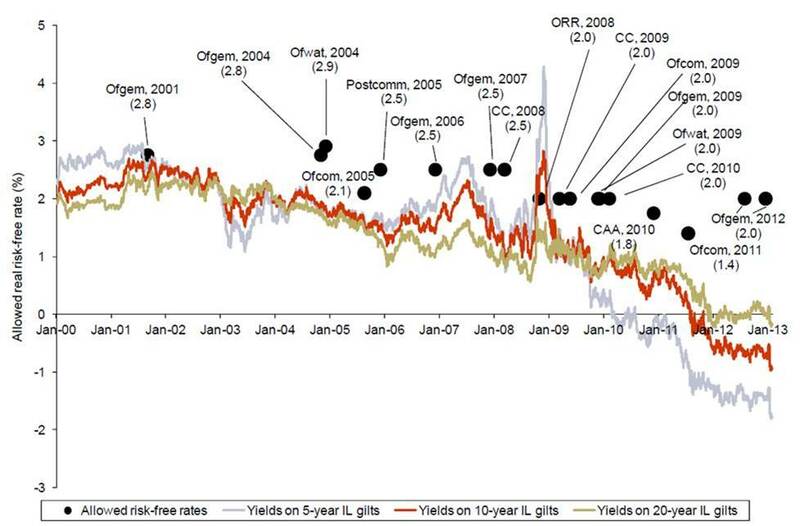 I am grateful to Martin Malinowski for drawing my attention to this Oxera chart which clearly shows that regulators' estimates of the cost of risk-free capital have substantially - and over many years - exceeded the cost that they eventually met in the market. Given that total regulatory capital was c.£200 billion, this represents a transfer from customers to shareholders which cumulatively reached £s tens of billions. I understand, for instance, that Macquarie earned received an equity return of around 20% on its decade long investment in Thames Water. Regulators, when challenged, point out that the risk could have fallen the other way, and customers could then have benefitted greatly. But Martin Malinowski points out that this is to ignore the fact that regulated companies can usually apply to re-open price controls should significant unfavourable movements result which increase their costs significantly. Regulators are however also aware of the criticisms implicit in the above chart and are probably beginning to make the necessary changes to their price control formulae. One solution might be for regulators to use prevailing (or short-term forecast) interest rates when setting price controls, maybe within error bands. Customers would then get refunds or face surcharges if the forecasts were seriously wrong. Whether customers (and voters) would welcome this possible volatility might be another matter. Important Note:- Unchecked market power (monopoly power) does not necessarily lead to price increases. The relative lack of competitive pressure can also leads to one or more of lower product or service quality, or a reduced product range, or poorer customer service. Price controls therefore need address all of PQRS - price, quality, range and service - for otherwise a tight price control will merely lead to greater problems in non price outcomes including Q, R and/or S. A further discussion of this subject is here.